Western Cape Guest Farms provide you with quality accommodation and various options for your farm holiday rentals. If you are looking for farm bed and breakfast only, self-catering cottages in the Cape or full-board so that you don't have to cook for the duration of your holiday you will find all of those possibilities listed in our farm accommodation below. Please contact the owners directly for your next farm holiday in the beautiful Western Cape Province of South Africa; a land just waiting to be explored! Are you looking for more information on what to see and do in this area? If so, visit our Western Cape Farm Holidays page for more details. And if you are in the area read our Western Cape Produce page and read about some top wine estates in the area that you could visit while you are there, including local produce. If you are a farm owner and you have accommodation that you would like to advertise, we offer both free and paid advertising space. See our Advertise your Farm page for more details. Imagine waking up to this beauty, tranquility and freshness? Come and experience it for yourself at Rolbaken Guest Farm, a working sheep, lucern and wine farm. You will be surrounded by wonderful views of the Outeniqua, Swartberg and Kammanassie mountains. 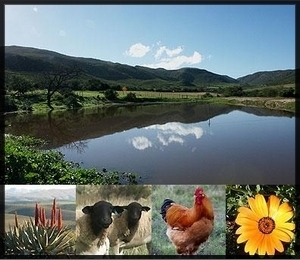 The farm is situated in the Little Karoo just 40 kms from Oudtshoorn and an hour from George and the Garden Route, making it an ideal springboard for exploring the area’s wealth of tourist attractions such as the Highgate Ostrich farm, the Cango Wildlife Ranch, the Cango Caves and much more. However if you need a break from the rush, the farm is the ideal place to unwind and recharge your batteries. There are lovely walks along the farm roads, dams to swim in, bird watching and hiking. You can cycle in the area or on the farm if you bring your bicycles. For more information on their accommodation, rates and delicious meals visit their website or send them an e-mail.